Encanto Manor was part of a suburban estate developed by James W. Dorris, a successful retail and wholesale grocer. Dorris came to Phoenix and purchased an interest in a small confectionery store in 1888. His business increased steadily and by 1892, he established a grocery at the southwest corner of First and Washington streets, It was said to be the finest and largest grocery store in the city and covered two floors and a large storage room (Arline, A). He expanded into the wholesale market and his business continued to increase. In 1907, Dorris' success allowed him to purchase a half-section (320 acres) of land bounded by 7th and 15th avenues and McDowell and Thomas roads. In 1911, Dorris hired a California architectural firm, Fitzhugh and Fitzhugh, to design a large Mission Revival style house accessed from 7th Avenue (2712 N. 7th Avenue) by a circular drive. His family moved into the house in 1912. In 1926, Dorris announced plans to subdivide the entire 320-acre "J. W. Dorris Addition" to include a hotel and 18-hole golf course. The ambitious project failed to materialize but Dorris began selling off smaller parcels in a piecemeal fashion with strict stipulations about the nature of development to take place. 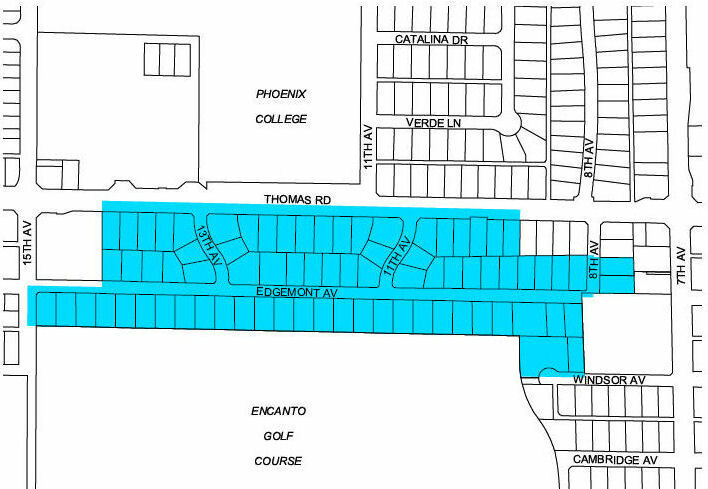 Subdivisions cut from the Dorris tract became among the most prestigious addresses in Phoenix. They included the Palmcroft and Encanto subdivisions. In 1934, Dorris sold more than 100 acres to the city of Phoenix for Encanto Park and the first nine holes of the Encanto Golf Course (Phoenix Gazette, Section B). A strip along 7th Avenue was subdivided as Encanto Vista shortly before his death in 1943 (Arizona State Historic Property Inventory). By 1945, the Dorris' House, known as Casa de Rosas, lay on a 2 ½ acre parcel sold to the Congregational Conference of Southern California and the Southwest. Services for the Encanto Community Church were held in the house and the minister and his family lived in the upstairs before the carriage house was renovated for their use. At the same time, the church sold land to the west of the house to Delbert L. Stapley who subdivided it for houses on Edgemont and Windsor. In 1950-51, the church built a new sanctuary just south of the Dorris House which now serves as a community center for the congregation (Arline, B). Both the Dorris House and the church lie in the Encanto Manor Historic District. House lots in Encanto Manor are generous compared to prevailing postwar standards, averaging approximately 8,700 square feet. Large lots accommodated significantly larger houses than the average in the postwar era, which attracted upper middle-class families to Encanto Manor. Also, larger lots were more expensive, drawing people with more money. Principal selling points for Encanto Manor were its location near a major public park and golf course (Encanto Park and Golf Course), and Phoenix College. Advertisements for Encanto Manor touted the subdivision's "luxurious living" and that it was "just a putt" away from the golf course. Although all houses in Encanto Manor are near the golf course, only those along the south side of Edgemont were afforded golf course views, increasing the exclusivity of this street. Following pre-war tradition, many different builders and architects contributed to Encanto Manor's development, a fact that resulted in a variety of design motifs and materials. Several notable builders and architects were active in Encanto Manor. Builders include David Murdock, C.L. Jones, A.B. Campbell, C.F. Crittenden, E.J. Wasielewski, John H. Lester, D.L. Brown, C.L. Maddox and F & S Construction. Significant architects include Frederick Weaver, Benjamin Goor, M.E. Lewis and Sam Hoffman. Postwar houses in the Encanto Manor Historic District are all variations on the then-fashionable Ranch style which dominated residential design after World War II. 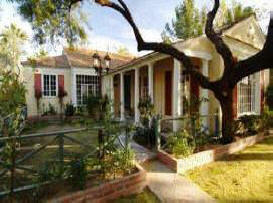 Encanto Manor's Ranch style houses are all one-story, a hallmark of the design. 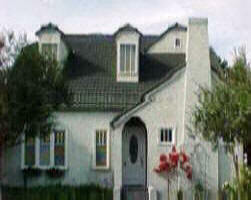 Most feature hipped roofs and steel casement windows. Virtually all of the historic district's houses are masonry and more than two-thirds are rendered in brick with the rest constructed of painted or stuccoed block. Variations on the Ranch style found in the district include French Provincial, as typified by the Carson House at 1320 W. Edgemont Avenue, American Colonial, on the Divelbess House at 855 W. Edgemont Avenue, and Transitional Ranch, such as the Hensley House at 1321 W. Thomas Road. Brick patterns and tile roof ridge caps are common ornamental features found in Encanto Manor. With only three exceptions: the 1911 Dorris House at 2710 N. 7th Avenue and two houses built in the 1970's, Encanto Manor was fully developed between 1945 and 1960. In fact, Encanto Manor was largely constructed within a five -year period, between 1945 and 1950. During that brief time, 69 resources including the church were completed. An additional 13 houses were constructed between 1951 and 1960. Only two houses were constructed after the period of significance, and both follow Ranch style traditions. With the exception of the Dorris House, all construction occurred within a thirty-year period of time. The district has been well maintained in the ensuing decades and none of the houses have been demolished. Alterations have generally been limited to window, porch post, and roofing material replacements, enclosure of carports, and the application of paint or stucco on masonry walls. The district retains a high level of integrity with 85% of resources contributing to the historic character of the neighborhood. When developers began planning Encanto Manor after World War II, they enticed homeowners with promises of "luxurious living." They offered generous lots that could accommodate rambling, custom-designed ranch-style homes and ample front yards. Would-be residents could also take advantage of one of the city's crown jewels just to the south, the sprawling Encanto Park and its golf course. The centerpiece of the neighborhood remains the 1911 Dorris House, a stunning Mission Revival-style house facing Seventh Avenue that is part of Encanto Community Church. James W. Dorris, a wealthy grocer, owned more than 300 acres of land in the area and had grand plans to build a hotel and 18-holf golf course. But the project never got off the ground, and Dorris ultimately sold off land to developers for neighborhoods like Encanto Manor, city historical records show.